Time for another retro recipe. This time we visit the land of curries with Marguerite Patten’s ‘Book of Fish, Meat, Poultry and Game’. Published in 1962 by Paul Hamlyn Ltd.
Cut the lamb into cubes and fry these in the butter for a few minutes then remove from the pan. Mix the meat with the yoghourt and curry powder. Slice and fry the onions, garlic and celery. Add the meat mixture and sauté for 5 minutes. Stir in the stock, add salt, bring to the boil, them simmer for about 45 minutes. Add the sliced banana and chutney. Continue cooking slowly for a further 15 minutes. 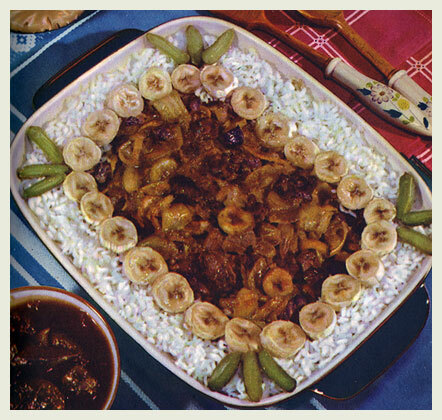 Serve in border of rice, garnished with banana and gherkins, and accompanied by chutney, pineapple and ginger. *You may find this cooking unit converter handy to convert from imperial measurements to metric. I love the presentation. Truly I do! I’m not one for modern fancy towers of food with ickle dribbles of sauce, sorry, jus. I love me some kitsch presentation. I fancy a few gherkins and some curry now. Nom.